Yoga Synergy offers a practice that is safe for the modern body across all levels of fitness. It’s suitable for those who have not tried yoga before or have injuries, but is also challenging for those more familiar with a regular physical practice such as professional dancers, elite athletes and advanced yoga practitioners. Earth, Water, Fire, Air and Ether - these 5 dynamic sequences of yoga postures taught in the Yoga Synergy method, have been specially designed by Simon Borg-Olivier and Bianca Machliss, who are both experienced yoga teachers and qualified physiotherapists. Our newly qualified Teacher Trainees (200h Yoga Alliance certificate) start by teaching the basic sequence: Yoga Synergy Fundamentals sequence. The 500h Yoga Synergy Teacher Training certificate enables teachers to teach the 5 Element sequence as taught in Sydney, Australia. In the Yoga Synergy method, each of the 6 different sequence are taught progressively in all classes over a 9 week period. For example, in the colder months you’ll practice the Fire sequence with its dynamic, energizing postures that will warm your joints and muscles. 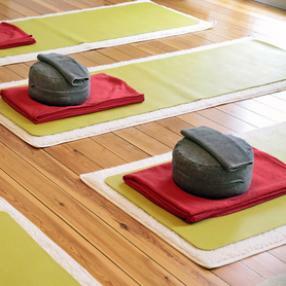 And every class concludes with meditation exercises to leave you feeling completely calm and relaxed. All students are encouraged to understand the simple versions of the postures before attempting the more complex versions. When doing regular practice it’s important to respond to your body “in the present moment” and not be attached to where you want to be in the future or where you perhaps were in the past. By working like this, you’ll be able to generate energy, by working in an appropriate manner at all times to create a meditative flow practice. All 6 sequences can be practiced using this responsive practice philosophy at any time of year in any physical state, to balance your energy. 2014 Sydney sequence dates are as follows: Earth 3 Feb, Water 7 Apr, Fire 9 Jun, Air 11 Aug, Ether 13 Oct.
By coming regularly, you’ll have the opportunity to learn each of Yoga Synergy’s five sequences and develop your own practice. That means you’ll be able to practice safely and independently at home. To help you remember the practice, we have many DVD's available, or just come along regularly and you'll soon be on your way to self practice. 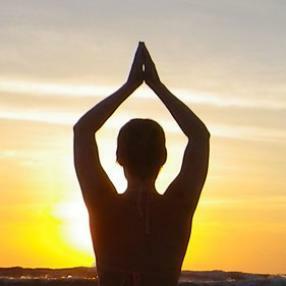 The Yoga Synergy style is a technique/philosophy of practice that can be applied to any style of yoga. All yoga practice should be done with the intention to energize the body while calming the mind. The Yoga Synergy sequences were named in honour of the pancha mahabhuta (5 Great Elements) of Hinduism and Aryuveda that are believed to make up all of creation, including the human body - which, upon death, dissolves into these five elements of nature, thereby balancing the cycle of nature set in motion by the creative force of the universe. Floor-based, no-impact corrective bodywork, targeting the core stabilising muscles used for sitting, walking and moving. It builds a stronger, more flexible body without the bulk. Therapeutic and fun, it’s suitable for couch potatoes to Olympians and is especially good for assisting the healing of injuries (it was originally designed to help injured dancers get back on the stage. Tone your abs, stretch your hamstrings and help cure – or prevent – back injuries. Each session offers gentle and stronger options to suit every ‘body’. You will feel very welcome at these classes. Our Dynamic Yoga classes are high energy. Each class has a theme and we blend yoga, high intensity training, tai chi, dance and meditation. You will sweat and shed all the stresses from the day. Dynamic is mentally tough, you will start to notice your internal dialogue while under pressure and that’s when you can start to become bolder. Physically, your body will develop more strength, more flexibility and more cardio endurance. Wear exercise clothes and bring a yoga mat or you can borrow ours. Mat Pilates is a safe, low impact and effective whole body exercise system that tones, stretches and improves body posture. Suitable for any level of fitness.